Boat rental L'oiseau des îles ll by fishing area and the duration of the output selected. The loan of equipment multi-fisheries (see special conditions in category "fishing equipment"). An experienced crew at your disposal. Meals and drinks on board. CYRIL FAURE reserves the right to cancel a fishing trip if the weather does not ensure the safety of the vessel and persons on board. In this case, your output will be refunded. However, if an output is terminated at the request of the client, the benefit is due. If a client cancels his reservation, Cyril Faure must be notified no later than two months in advance for reasons of organisation and planning, or risk losing the deposit paid in advance. CYRIL FAURE Ltd reseves the right to change prices without notice. Fish are the property of the boat. 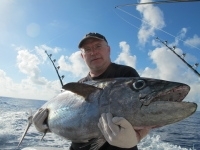 To succeed in your fishing trip, we suggest you mix the formula according to your desires, like the Tour of the Grand Banks, the most prestigious programs for fishermen who have the ambition to live in fishing paradise. Only requirement: Passion and endurance. 1 – A day on the continental shelf of Rodrigues (average depth of 60 metres), which descends gradually until it fell. It is spread unevenly around the island to the far east, the fall is about 10 miles from Port Mathurin, while in the west it takes 21 miles to find the break. 3 and 4 – The Bench of the East: 2 days/1 night or 3 days/2 nights. 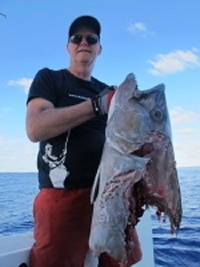 Getting Rodrigues without thinking of the East Bench, with a night fishing are still strong emotions. Located 50 miles east, it is actually a huge structure that offers more than 2000 metres of altitude. This "half submarine Mont Blanc" spread over an area of 100 km2. Rising to 41 metres below the surface, it is a real springboard for the ocean currents that, in striking it, create fabulous upweilling, cooler full of fodder. 5 and 6 – The Bench of the West "Jiggers'land": 4 days/3 nights or 5 days/4 nights. The continental shelf extends west to the West Bench referred as HAWKINS, 100 nautical miles of Rodrigues, through "marlins' boulevard" where the big marlin prowl, steep drop-offs in the middle of the Indian Ocean, forming the food chain, from 43m to 4000m, real seamounts! All the superlatives can be used for hot spot which, is the area of futur records. 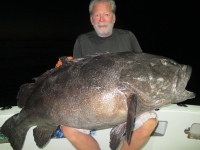 Will you be the next keeper of a record on a dog tooth tuna, a Jack, a marlin or a grouper the size and weight unmatched??? The distance of the bench Hawkins requires a night's sail to get there, another night to return. Departures are docked at Port Mathurin the first day at 4pm and return at 10am. We recommend you mix the formula to "taste" every pleasure offered by each of the proposed areas. The choice is yours! mix your desires. We are here to make your fishing dreams! * Reminder: "Jiggers'land" formula is unique to the program from October to May.